WASHINGTON, D.C.— As House and Senate conferees prepare to negotiate a Department of Homeland Security funding bill, Republican Whip Steve Scalise (R-La.) 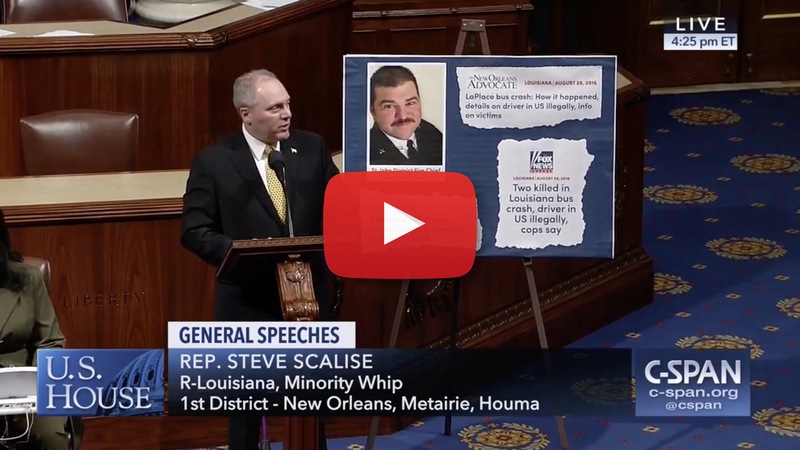 took to the House floor to share the human cost of open borders by telling the story of Spencer Chauvin, a Louisiana fire chief who was struck and killed by an illegal immigrant while out on a call, leaving behind a wife and two young children. He stressed the importance of funding our border security and returning to the rule of law so senseless tragedies like these don’t happen again. Click here or on the image above to watch the speech. "Well I thank the gentleman from North Carolina for yielding and for bringing attention to what we are here to talk about tonight. This would have been the State of the Union that the President was initially invited by the Speaker to deliver, back on January 3. I'm glad, Mr. Speaker, that ultimately we’ve got a new date that the Speaker has invited the President to come to this chamber, the People's House, on February 5th, where President Trump will finally have the opportunity to address the people of this country on the State of the Union, as the Constitution prescribes. "And we have seen over time it’s been done in many different ways, George Washington started the tradition in 1790 by actually addressing a joint session of Congress as opposed to just sending a letter and it’s been done different ways over time but for over the last 50 years it has been done here in this House chamber every single year and I'm glad we finally will have the opportunity to see the tradition continue. Mr. Speaker, when you talk about the State of the Union and some of the things that President Trump has been fighting for, the main things he has been fighting for are to deliver for the American people on getting the economy back on track and keeping America safe. And part of keeping America safe, Mr. Speaker, means securing America's border. "And that's really what was at the heart of the fight over the last month of this government shutdown. You know a lot of people in Washington are so focused, Mr. Speaker, on who is to blame or who won the week, who is the winner or who is the loser and you hear everybody saying that okay, well, Nancy Pelosi was able to hold the State of the Union hostage and somehow that is a victory for the American people - that she denied the President the ability to come here to the People's House to share his message. I wouldn't be bragging about that as a victory if I was Speaker Pelosi, because ultimately what that means is that she is afraid of having the American people hear the message that President Trump had to say. "That message will be distributed next week. A part of that message involves why we need to secure the border. That is really at the heart of this debate: why do we need to secure America’s border? There are some people questioning whether or not we need to secure America’s border. "The good news, Mr. Speaker, is that there are not many people in this country that wonder whether or not we should secure the border. The bad news is the few people that are in that category - one of them is the Speaker of the House of Representatives. And so we are going to continue to have this debate. On February 5, when you hear President Trump give this message, I’m sure some of the things we are going to hear are the horror stories that we have had because we don't have a secure border. I have experienced something and I have heard firsthand from constituents in my district about what is at stake. "I had the opportunity to get a call from a mother of a fire chief in south Louisiana, Spencer Chauvin. Spencer Chauvin was responding to a call, like he did, he was a public servant, a fire chief in St. John the Baptist Parish. As he was responding to that call, Mr. Speaker, he was killed by someone who is in this country illegally. He never got to go home that night to a six-year-old and eight-year-old and he doesn't get to talk to his mother anymore. After his mother and I talked, she mailed me this last week, Mr. Speaker, and it's a coin. A coin in tribute to Spencer Chauvin. "I keep this coin with me as a reminder of what's at stake in human terms, because we could talk about who won the day or who won the week, but is it really victory when the result of Speaker Pelosi's victory is that there may be more victims like Spencer Chauvin across this country because we haven't secured our border? President Trump didn't campaign saying he needed $5.7 billion to build a wall. President Trump talked about building a wall to secure our border. "When he became President, the experts who risk their lives, men and women who are not partisans, men and women who wake up every day, whether it was Barack Obama as president or Donald Trump as president, they just go to the border and risk their lives to keep the bad people out. There is a way for good people to come in. If you want to come in legally, like a million people every single year we let into our country legally, there is a legal way to do it. If you are seeking asylum from all around the world, Mr. Speaker, there is a legal way to do it. In fact, this caravan you saw coming in to America where they stormed through Mexico’s border on the southern border of Mexico - they stormed through that border and they wanted to storm through our border because we don't have a physical barrier. "They were offered asylum by Mexico. They were offered work permits by Mexico and they turned that down. So are you really an asylum seeker if you turn down asylum along the way here? It’s not about asylum. It's about whether or not we’re going to get back to rule of law and secure our border. "The experts who risk their lives say it is going to cost $5.7 billion to secure our border, to give them the tools that they need (and that includes a physical barrier). So now that we are seeing a growing list of Democrats, including the Majority Leader Steny Hoyer, saying physical barriers ought to be a part of the solution, in conclusion Mr. Speaker, what I would say, when we open the People's House to the President on February 5th, is let's heed the call of Republicans and Democrats alike who recognize we need to secure our southern border, so that we can get back to rule of law and prevent more Spencer Chauvins from becoming victims to an open border. With that, I yield back."